L 23″ (58 cm) W 36″ (91 cm). Description: Sexes similar. Breeding adult glossy brownish-green above and below, with maroon facial skin; white feathers surround facial patch; bill very long, curved strongly downward; bill, legs and feet maroon. Nonbreeding adult with some white streaking on head and neck; face, bill, feet, and legs gray. Adults in all plumages have red eyes. Immature similar to nonbreeding adult but have brown eyes. 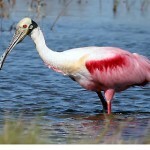 Habitat: Wetlands such as marshes and wet meadows. Nesting occurs in marshes having extensive emergent vegetation. Where in Nebraska: Fairly common regular migrant in the spring and fall mostly, least common in extreme eastern Nebraska. Less common in the east. Uncommon casual breeder in central Nebraska, primarily at Sandhills marshes and Rainwater Basin wetlands. 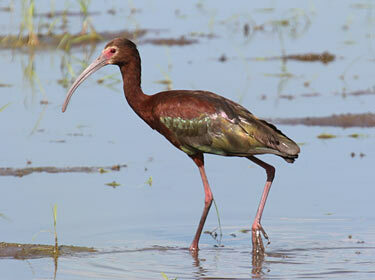 Field Notes: Ibises fly in diagonal lines or V formations with their heads and necks extended and long legs trailing. 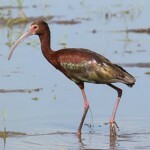 Fun Facts: The White-faced Ibis nests and roosts in trees with other wading birds.